I love your rainbow bins. But if i make them i will make a mini quilt to put on top since i find that my open storage gets dusty and then i am sneezing a lot when i sew. I'm also in Florida and can't wait for our warm weather to come back. Love your blog. Thanks for hosting the party! 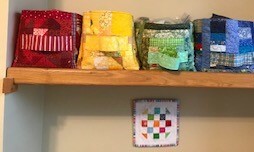 I'm loving your scrap bins and would love to make some myself--I just need to figure out a place to put them. Yellow is a great choice for February! Such pretty rainbow scrap bins! Hope you find the perfect house and that it's not too much work that takes away from your sewing time! I love your rainbow of scrap bins! Looking forward to playing with yellow this week! 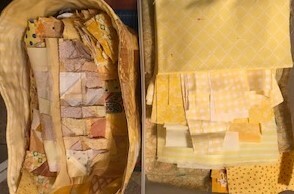 I pulled out all my yellow scraps yesterday...anxiously waiting for Tuesday. I'm enjoying yellow in February, a good choice. 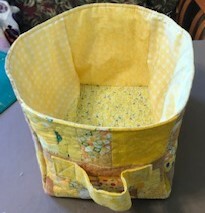 I like your little fabric bins, I had started these, I have three done and two begun, however I stall at the adding the cardboard, I might have to make this one of my One Monthly Goals. Sometimes I just need deadlines (or goals). You are inspiring me. I would love to know what you used for cleaning the grout! I have a hard time getting or keeping my clean. Also, love the baskets. I might have to make some! But, WAIT!!! You're not moving before Sydney graduates, are you?!?! Thank you so much for declaring February yellow month. We need the sunshine! Funny how your scrap bin was yellow. Was that a hint? The handles are great ideas on the fabric baskets. I may have to add those to mine. Hope the house prep is going well. I remember that from the last time we moved. You get done and you think, now I'm leaving and don't get to enjoy it. Good luck with the house hunting.